How much would we understand about human evolution if we had never discovered genetics or DNA? How would we track the development of the human species without taking into account the universal code of life? Yes, we could study ancient trash heaps to estimate people’s average caloric intake over time. Or we might seek clues in burial mounds regarding population growth rates and changes in our physical characteristics over time. But without access to the fundamental unit of analysis of human evolution, our understanding would be fragmentary and incomplete at best. Such is the plight of the social scientist seeking to understand the past, present, and likely future of the economy without an appreciation of code. 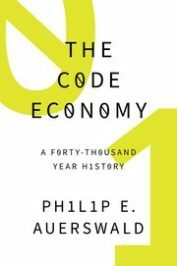 Code is the DNA of economy. It is how ideas become things. The evolution of code is the story of the progress of human society from simplicity to complexity over the period of millennia. We can track GDP over time or measure employment rates. But without access to the fundamental unit of analysis of economic evolution, our understanding would be fragmentary and incomplete at best. If you hear the word “code” you’re likely to think of computer code. That is one form. But consider the word code more broadly. The word “code” derives from the Latin codex, meaning “a system of laws.” Today code is used in various distinct contexts beyond computing—genetic code, cryptologic code (i.e., ciphers such as Morse code), ethical code, building code, and so forth—each of which has a common feature: it contains instructions that require a process in order to reach its intended end. Computer code requires the action of a compiler, energy, and (usually) inputs in order to become a useful program. Genetic code requires expression through the selective action of enzymes to produce proteins or RNA, ultimately producing a unique phenotype. Cryptologic code requires decryption in order to be converted into a usable message. Ethical codes, legal codes, and building codes all require processes of interpretation in order to be converted into action. Code can include instructions we follow consciously and purposively, and those we follow unconsciously and intuitively. Code can be understood tacitly, it can be written, or it can be embedded in hardware. Code can be stored, transmitted, received, and modified. Code captures the algorithmic nature of instructions as well as their evolutionary character. Code as I intend the word here incorporates elements of computer code, genetic code, cryptologic code, and other forms as well. But you will also see that it stands alone as its own concept—the instructions and algorithms that guide production in the economy—for which no adequate word yet exists. To convey the intuitive meaning of the concept I intend to communicate with the word “code,” as well as its breadth, I use two specific and carefully selected words interchangeably with code: recipe and technology. The culinary recipe is not merely a metaphor for the how of production; the recipe is, rather, the most literal and direct example of code as I use the word. There has been code in production since the first time a human being prepared food. Indeed, if we restrict “production” to mean the preparation of food for consumption, we can start by imagining every single meal consumed by the roughly 100 billion people who have lived since we human beings cooked our first meal about 400,000 years ago: approximately four quadrillion prepared meals have been consumed throughout human history. Each of those meals was in fact (not in theory) associated with some method by which the meal was produced—which is to say, the code for producing that meal. For most of the first 400,000 years that humans prepared meals we were not a numerous species and the code we used to prepare meals was relatively rudimentary. Therefore, the early volumes of an imaginary “Global Compendium of All Recipes” dedicated to prehistory would be quite slim. However, in the past two millennia, and particularly in the past 200 years, both the size of the human population and the complexity of our culinary preparations have taken off. As a result, the size of the volumes in our “Global Compendium” would have grown exponentially. Let’s now go beyond the preparation of meals to consider the code involved in every good or service we humans have ever produced, for our own use or for exchange, from the earliest obsidian spear point to the most recent smartphone. When I talk about the evolution of code, I am referring to the contents of the global compendium containing all of those production recipes. They are numerous. This brings me to the second word I use interchangeably with code: technology. If we have technological gizmos in mind, then the leap from recipes to technology seems big. However, the leap seems smaller if we consider the Greek origin of the word “technology.” The first half derives from techné (τέχνη), which signifies “art, craft, or trade.” The second half derives from the word logos (λόγος), which signifies an “ordered account” or “reasoned discourse.” Thus technology literally means “an ordered account of art, craft, or trade”— in other words, broadly speaking, a recipe. Substantial anthropological research suggests that culinary recipes were the earliest and among the most transformative technologies employed by humans. We have understood for some time that cooking accelerated human evolution by substantially increasing the nutrients absorbed in the stomach and small intestine. However, recent research suggests that human ancestors were using recipes to prepare food to dramatic effect as early as two million years ago—even before we learned to control fire and began cooking, which occurred about 400,000 years ago. Simply slicing meats and pounding tubers (such as yams), as was done by our earliest ancestors, turns out to yield digestive advantages that are comparable to those realized by cooking. Cooked or raw, increased nutrient intake enabled us to evolve smaller teeth and chewing muscles and even a smaller gut than our ancestors or primate cousins. These evolutionary adaptations in turn supported the development of humans’ larger, energy-hungry brain. Featured image credit: Untitled by Pixabay. CC0 via Pexels. Philip Auerswald is an Associate Professor of Public Policy at George Mason University and a Senior Fellow at the Kauffman Foundation. He is also the Co-founder and Co-editor of Innovations, a quarterly journal about entrepreneurial solutions to global challenges and the author of The Code Economy: A Forty-Thousand Year History.